sour cream cake with cocoa filling. Hello, friends! I don’t know about you, but I had a very exciting holiday season, and I pretty much made out like a bandit. Among the host of awesome baking tools and cookbooks I received was a standing mixer from my favorite certain someone. It’s awesome and amazing, and also makes me fairly certain he has a huge crush on me. It’s grey and lovely and fits quite nicely into our increasingly fort-like apartment. Granted, it also takes up a surprisingly large percentage of our kitchen’s already hard-pressed food prep space market, but it’s still the coolest thing ever, and I’m certain it’s going to do lovely things for us. After we’d finally figured out a place for the mixer to live and gotten settled after our holiday travels, I started poring through my new books to find something pleasant to make for a New Year’s Day potluck we were going to attend. My curiosity was piqued at pretty much everything in the Culinary Institute of America’s hefty tome, but eventually I settled on a cake from The Simple Art of Perfect Baking: a nice little sour cream tea cake with a cocoa filling and a jam glaze topped with a second, shiny glaze for a pretty, translucent effect. Also, it’s a bundt cake, and as I’d just received such a pan (I told you I made out like a bandit), it turned out I even had the right tools for the job. Obtaining ingredients for cake on New Year’s Day was a little bit of a to-do, but we managed to scrounge up ingredients in one form or another. I set to work on the recipe, excited to try something by Flo Braker (I’ve read nothing but stellar things about her). First, butter is creamed, and then some sugar is added, followed by eggs and vanilla. Using the mixer is quite satisfying; what would have taken a few minutes and some wrestling with a hand mixer was super easy with my new guy. At any rate, then the dry ingredients are mixed into the liquid, alternating with the sour cream. I was a bit troubled by the thickness of the batter, but apparently that’s the way it’s supposed to be. The batter and the cocoa take turns getting into the pan, creating a nice little marble in the finished product. 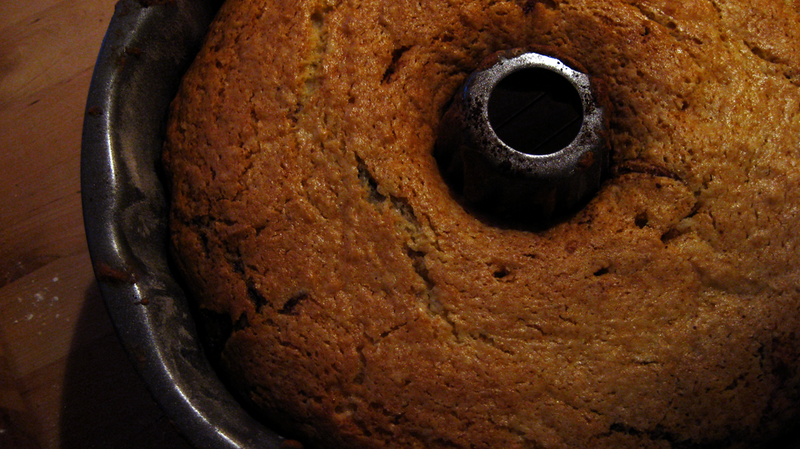 Then the cake hangs out in the oven for about an hour while the hot air does its magic. While that was happening, I set up the ingredients for the glaze, which mostly involved straining a bunch of jam to come up with a half cup of liquid. I’m sure this is quite easy and quick if one has proper equipment, but all I had was a fine mesh sieve, so I had to let the jam strain for quite a while before I had the right amount. Braker’s recipe says apricot jam, but I went with a combination of blood orange marmalade and apricot spread, for funsies. I put the strained jam in a sauce pot and then sifted some confectioner’s sugar for the second glaze. After the cake had cooled and been freed from the pan, I heated up the jam and coated the cake with it. When the first glaze had chilled out a bit (maybe ten minutes later), I mixed some water into the confectioner’s sugar for the second glaze. Some of the still-warm jam mixed with the sugar glaze when I was coating the cake with the second time, but it ended up not affecting the appearance. 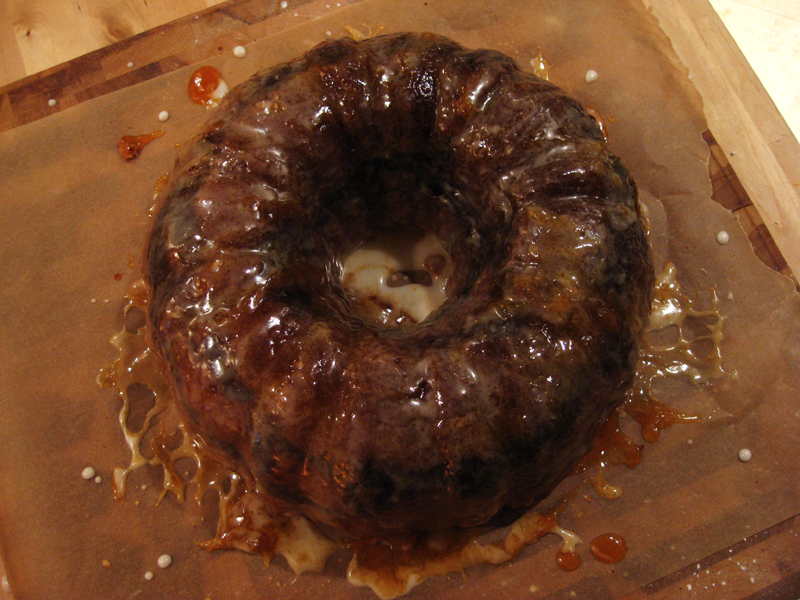 After about 15 minutes of resting, the cake looked beauteous and appealing: shiny, crackly sugar glaze on top of a marbled brown and tan cake. Later, after we’d eaten way, way too much delicious food at the potluck and spent what was probably too short a time recovering from dinner, we broke out the cake. And not to toot my own horn or anything, but I have to say that I was really proud of it. The cake was just the right amount of sweet and had a moist, fluffy crumb, the cocoa filling was a nice offset to the sour cream flavor, and the glaze was crackly and sugary without being cloying. The only disappointing thing about it was that didn’t bring it home with us at the end of the night (a decision we regretted the following day). So, Happy New Year, folks. Make some cake, and stay warm. Preheat your oven to 350 degrees and place a rack in the lower third of the oven. 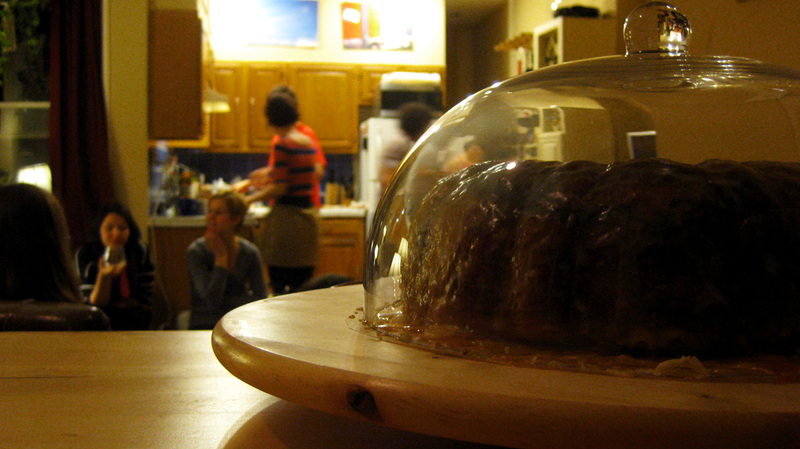 Using a paper towel, grease the bottom and sides of a 10-inch bundt pan. Dust generously with flour, shake to distribute and tap out the rest. for the filling. Pour the brown sugar, 1 tablespoon granulated sugar, cocoa and cinnamon into a sieve over a small mixing bowl. Whisk to combine and set aside. for the cake. Pour the flour, baking powder, baking soda and salt, in that order, into a triple sifter. Sift onto a sheet of waxed paper. Set aside. Crack the eggs into a small bowl and whisk to combine the yolks and whites. Add the vanilla and stir to blend. Place the butter in the bowl of a heavy-duty (!) mixer. With the paddle (in my family we called it a k-hook, but I’m not sure if that’s right), cream the butter on medium speed until it is lighter in color, clings to the sides of the bowl, and has a satiny appearance (30 to 45 seconds). Maintaining medium speed, add the granulated sugar in a steady stream. When the sugar is added, stop the machine and scrape down the sides with a rubber spatula. Increase speed to medium and continue to cream until the mixture is light in color and fluffy, about 4 to 5 minutes. Maintaining medium speed, pour in the egg mixture, cautiously at first, bit by bit. If the mixture gets at all watery or shiny, stop the flow of eggs and increase the speed slightly until a smooth, silky appearance returns. Then decrease the speed to medium and resume adding the eggs. Continue to cream, stopping the mixer to scrape the sides of the bowl at least once, until the mixture appears fluffy white and velvety and has increased in volume, 2 to 3 minutes from the time you begin adding the eggs. Detach the beater and bowl and tap the beater against the edge of the bowl to free the excess batter. Using a rubber spatula, gently stir in one-third of the dry ingredients. Then add half of the sour cream, stirring to blend. Repeat, alternating the dry ingredients and sour cream, ending with the remainder of the dry ingredients. Make sure you are scraping the sides of the bowl often with each addition. Mix until smooth and no pockets of flour remain, but make sure not to overmix. Spoon one-third of the thick batter into the pan. Using a rubber spatula, distribute the batter evenly around the bottom. Sprinkle half of the cocoa filling over the top, shaking the pan lightly to distribute evenly over the batter. Don’t worry if some of the filling clings to the outside of the pan. Repeat with another third of the batter, distributing it evenly and smoothly (you can use the spatula to drag batter over the filling if there are gaps). Sprinkle on the last half of the filling and add the rest of the batter. Spread evenly and smooth to level. Bake for 55 to 60 minutes, or until the top of the cake springs back slightly when lightly touched, the sides begin to contract from the sides of the pan, and a wooden toothpick inserted in the center comes out cake free. for the glazes. Fifteen minutes before the cake is done baking, spoon the strained apricot jam into a 1-quart saucepan. Sift the confectioner’s sugar into a small mixing bowl to remove any lumps. Place the cake on a rack to cool for 5 to 7 minutes. While it is cooling, over medium-low heat, warm the jam just to simmering and cook to evaporate some liquid and thicken slightly (about 2 to 3 minutes). Make sure not to overcook; when the jam is cool, the consistency should not be chewy. With mitts, tilt and rotate the cake pan and gently tap it on the counter to see if the cake is releasing from the sides. If you think the cake might be sticking, gently run a small metal spatula or table knife between the outer cake edge and the rim of the pan, freeing the sides and allowing air to get under the cake as it is rotated. Place a rack over the cake pan, invert it onto the rack, and carefully lift the pan to free the cake. Place the cake on its rack over a sheet of foil or waxed paper to catch glaze drippings. For the second glaze, mix the water with the confectioner’s sugar. Using a second pastry brush, cover the glazed cake with it. If the coating is too thick (opaque rather than translucent), stir in a few drops of water at a time into the glaze until it reaches the right consistency. Use all the glaze and cover the entire cake. As it cools, the glaze will dry and harden. For the nicest-looking results, do not move the glazed cake to a serving platter for a few hours; allowing it time to cool completely allows the glazes to cool and prevents cracking.